Evans Tri-Center Conga series simulates the bright, full sound and feel of animal skin while eliminating the problems associated with natural skin heads. Our goal is to process all orders within 24 hours of receipt. This Aquarian 22" bass drum head is a ported front bass drum head that features a 4" hole placed off center. Single ply in Video Gloss white. We specialize in anything drum related from the early 1900's to the 1980's. Evans EMAD2 series features two plies of film. The outer ply of 6.5mil and an inner ply of 10mil film provides an enhanced attack, focus and durability. The EMAD2 contains two interchangeable damping rings that maximize attack and low-end without removing the head or reaching inside the drum. Convert your acoustic kit into a hybrid kit and never look back again. When coupled with drum triggers and a drum module you will be able to produce perfect sounding drums for live or recording applications. Evans EQ4 series features a single ply of 10mil film. Bass Guitar. Upright Bass. Our goal is to process all orders within 24 hours of receipt. Best Match. This process may take 2 to 3 weeks. is Only Valid for Standard Ground Service to the lower 48 US states. 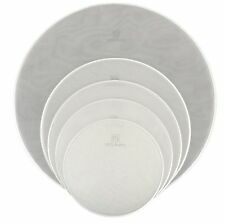 Remo PP1130PS Clear Pinstripe Drum Head PrePack 10"-12"-14"-16"
10" Clear Pinstripe. 12" Clear Pinstripe. 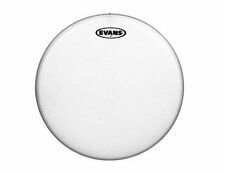 Evans coated EMAD batter series features a 10mil of single-ply film providing an ideal balance of punch, power and low-end. The EMAD contains two interchangeable damping rings that maximize attack and low-end without removing the head or reaching inside the drum. Aquarian Super Kick II Drum Head 20 in. 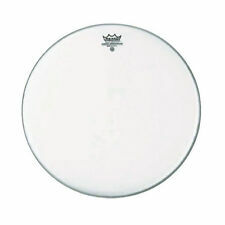 The Aquarian Super Kick II Drum head is a clear, 2-ply drum head with Super Kick muffling ring. It also features Aquarian's patented "Floating Muffling System". 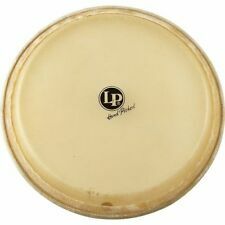 A narrow felt muffle ring is attached to the backside of the drum head to produce a low-end, well-defined punchy sound. The KickPort's patented design combines multiple engineering breakthroughs to create a deeper, fatter yet more focused bass drum sound. An Essential Accessory, The Revolutionary KickPort Instantly Improves The Sound Of Any Bass Drum! 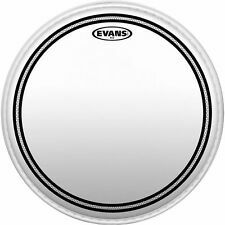 Evans Resonant Black Tom Drumhead 16 in. The thin 7mil Resonant Black head shortens sustain and brightens tone for enhanced projection during live performances. Very bright tone. 7mil, single-ply head. If you’re not satisfied, neither are we. 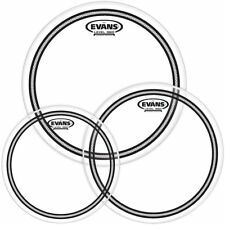 Evans EMAD Clear Batter Bass Drumhead 26 in. EMAD stands for Externally Mounted Adjustable Damping and this external system maximizes natural attack characteristics. If you’re not satisfied, neither are we. It’s that simple. 12" Coated Ambassador. 13" Coated Ambassador. 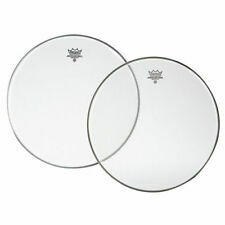 PAIR OF FLOOR TOM DRUM HEADS. Two heads included. For sale is a 20" Pearl bass drum head. Smooth white Remo Ambassador with the Pearl logo printed in black. May have light scratches, but has never been used. We specialize in anything drum related from the early 1900's to the 1980's. Send us your print ready art and we will create a custom bass drum head decal for you. A 22" decal that you apply to your bass drum head. ☆ Customize Your Drum Kit with Your Band's Artwork☆. Spray the mixture to the head and sticky side of the decal. 18" Gretsch Logo Fiberskyn Bass Drum Head. Attack 4pc Drum Head Pack Clear 12,13,16 w/Coated 14"
We specialize in anything drum related from the early 1900's to the 1980's. Aquarian Super-Kick III Black Drumhead 22 in. The Superkick III bass drumhead produces a low-end, well-defined punchy sound due to Aquarian's patented Floating Muffling System, which is a narrow felt muffle ring attached to the backside of the drumhead. Evans Resonant Black series features a single ply of 7.5mil film that responds quickly and projects well. With increased sensitivity and enhanced projection, the Evans Resonant Black drum head is optimal for live performances. All PureSound Snare Wires are designed and manufactured in the USA. Designed for 14" snare drums; 30 strands of wire. Steel coil produces a quick and crisp snare response. New Gear: If you’re not satisfied, neither are we. These incredible heads will fit all acoustic drums and are available in White, in these sizes: 8” to 22″. Want lower Product and S/H prices?. Correspondence is normally answered within 24 hours. 1 ply, 7 mil thick. Excellent low cost heads for drum rebuilds! White Color. 16" floor tom. Evans EC snare heads feature a single ply of 14mil film for maximum durability with single-ply sensitivity and feel. Sound Shaping Technology (SST) rings on the underside reduce unwanted frequencies and enhances attack. Evans Hydraulic Red Tom Batter Drum Head Skin - 6 8 10 12 13 14 15 16 18 20"
It makes rack toms sing and floor toms growl. Bridge Pins. We want your guitar to be in top form when you get it so you can start enjoying it straight away. When you receive your order, you must take reasonable care of the goods. 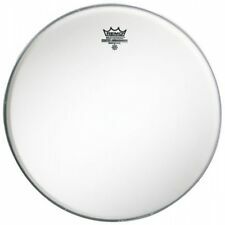 CODE Enigma Single Ply White Bass Drum Head. Resonant use, dampened sustain. Clear underside dampening ring. Quality aluminium rim with steel core. Front display head. New products (including 15” heads) are being added to the Code range late 2018/early 2019! Evans Level 360 technology is incorporated to extend the level playing surface of the drumhead, 360 degrees around the drum. Evans Level 360 technology resolves the age-old dilemma of traditional synthetic heads consistently not fitting the drum shell without using considerable force. 18" Gretsch Offset Logo Coated Bass Drum Head. 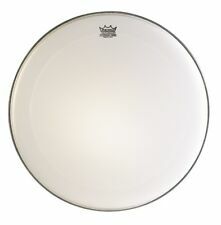 They have great attack, projection, and depth unlike any other drumheads. The patented Safe-T-Loc hoop prevents the head from slipping and the "Sound Curve" collar design provides "Responsive Tuning.". Evans Level 360 Technology™ is incorporated to extend the level playing surface of the drumhead, 360 degrees around the drum. Evans Level 360 Technology resolves the age-old dilemma of traditional synthetic heads consistently not fitting the drum shell without using considerable force. These incredible heads will fit all acoustic drums and are available in White, in these sizes: 8” to 22″. Want lower Product and S/H prices?. 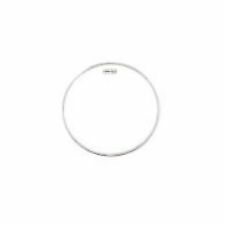 Evans UV EQ4 Bass Drum Head 26 in. 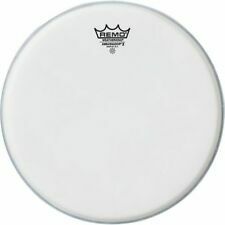 Remo Fiberskyn BG-0813-G5 Bongo Head 8 13/16"
Remo Fiberskyn BG-0713-G5 Great Britian Style Bongo Head 7 13/16"